People like lemon because it a delicous fruit. It contains vitamin C and good for our healthy. But, in this posting I don't talk about kind of lemon and i just talk about related between lemon and electronic. What will we talk is about small microcontroller project using Tiny AVR and lemon. As we know liquid of lemon can be use as electrolyte. Together with copper and zinc as electrode, it can produce amount of current. How much current? Its depends on the surface area of the electrodes in contact with the electrolyte as well as the quality/type of electrolyte. 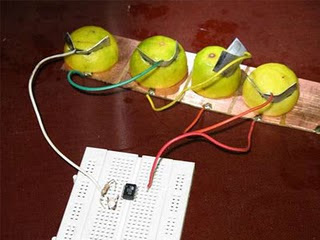 The voltage produce by lemon cell is about 0.9 V.
Although, there is small voltage. It can be used to powered PicoPower AVR microcontrollers. 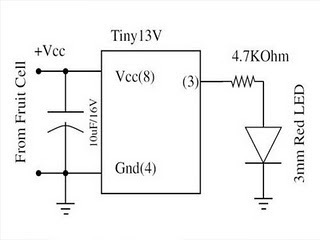 For example Tiny13V is very appropriate for such an experiment, since V type of AVR is rated to work down to 1.8V power supply voltage. If you don't believe just try by yourself at home. Here the link for instruction how to experiment with it step by step. Embedded Ethernet MiniCore™ from Rabbit!